GMT development has moved to the Github repository GenericMappingTools/gmt starting in August 2018. This site will remain operational for the near future but any code contributions or checkouts should be done from Github instead. We appreciate your patience as we transition to this new platform and hope that it will make contributing to GMT easier in the future. New issues should be reported at https://github.com/GenericMappingTools/gmt/issues. You'll need to register for a free Github account, if you don't have one already. Registration on this wiki does not work due to recaptcha1 problems. GMT is an open source collection of about 80 command-line tools for manipulating geographic and Cartesian data sets (including filtering, trend fitting, gridding, projecting, etc.) and producing PostScript illustrations ranging from simple x–y plots via contour maps to artificially illuminated surfaces and 3D perspective views; the GMT supplements add another 40 more specialized and discipline-specific tools. 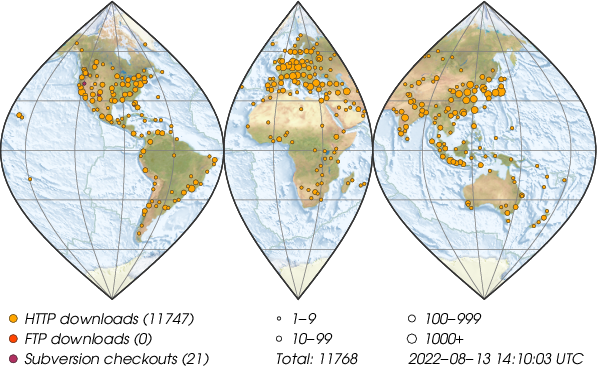 GMT supports over 30 map projections and transformations and requires support data such as GSHHG coastlines, rivers, and political boundaries and optionally DCW country polygons. GMT is developed and maintained by Paul Wessel, Walter H. F. Smith, Remko Scharroo, Joaquim Luis and Florian Wobbe, with help from a global set of volunteers, and is supported by the National Science Foundation. It is released under the GNU Lesser General Public License version 3 or any later version. Considering its flexibility at no charge, people worldwide are using GMT in their work and at home. Most users of GMT are Earth, ocean or planetary scientists, but there are apparently no limits to the kind of applications that may benefit from GMT: We know GMT is used in medical research, engineering, physics, mathematics, social and biological sciences, and by geographers, fisheries institutes, oil companies, a wide range of government agencies, and last but not least innumerable hobbyists. The map above illustrates the spreading of the current GMT release around the world based on web traffic. Each colored circle in the map above represents a 15x15 arc minute block with one or more users who downloaded the latest GMT release. Download geolocation is based on MaxMind's freely available GeoLite data.